Get creative, have a drink, and support the NEC! Please join us at Arts and Drafts for a fun, creative evening of upcycling workshops, music, drinks and environmental education! 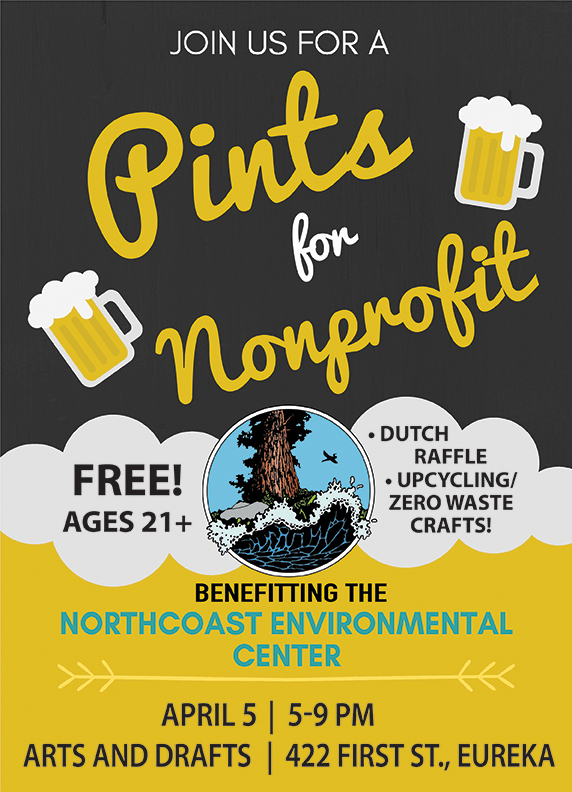 $1 of every pint bought will go to supporting your Northcoast Environmental Center. Come drink for a good cause! *Silent auction with great prizes! – We will be taking old things and giving them new life! The projects you can look forward to include turning t-shirts into reusable bags, transforming an old picture frame into a fancy new chalkboard, and making beeswax wraps. – Again, all of our upcycling workshops are free and you will be able to take home everything you make! ***All supplies will be provided, but if you have a favorite t-shirt lying around, cotton fabric you’d like to use for the beeswax wrap, or an old picture frame/items to decorate one with, please feel free to bring and use them! We are so excited to see you all there! Check out more details or RSVP on our Facebook event page here.